Preheat oven to 180°C. Place the eggs, cream, soy sauce, oyster sauce, onion and rice in a bowl and whisk until well combined. Heat half the oil in a medium non-stick ovenproof frying pan over medium heat. Add the egg mixture and stir for 30 seconds. Place in the oven and cook for 10–12 minutes or until set. While the omelette is cooking, heat the remaining oil in a small frying pan over high heat. Add the prawns and cook, turning, for 2–3 minutes or until cooked through. Top the omelette with the prawns, snow pea, coriander and extra onion. 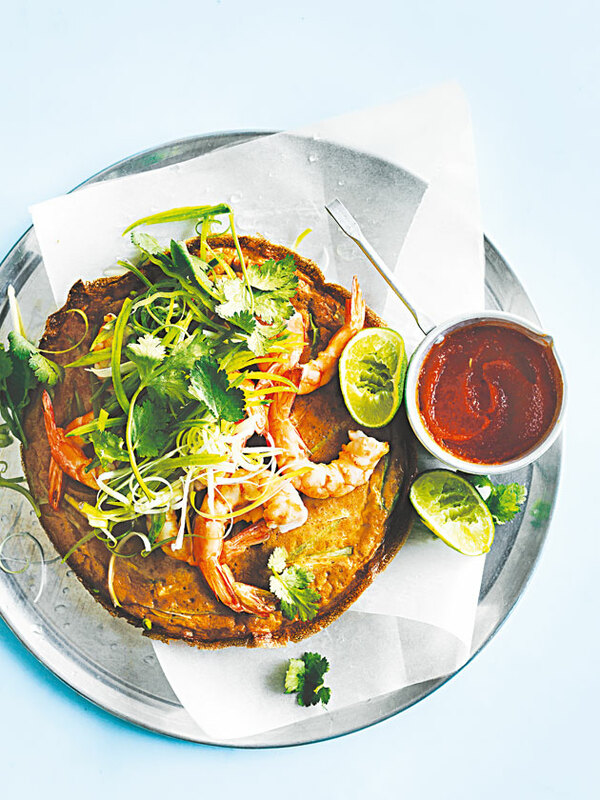 Serve with lime halves and chilli sauce. Serves 4.